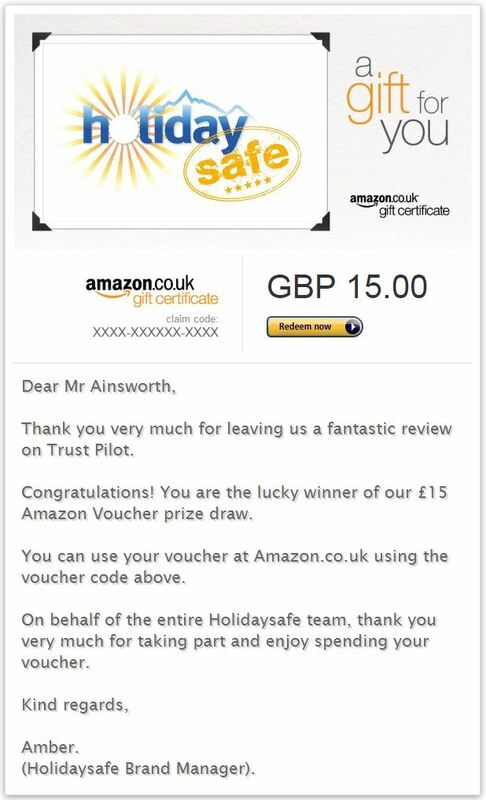 At Holidaysafe we always greatly appreciate customer feedback, as it allows us to ensure we are offering the rights products and prices to suit their needs. To ensure our customers had a place they could leave independent feedback we created a Trust Pilot page, and we have been overwhelmed by the fantastic response. So far Holidaysafe has received over 1,800 reviews, and our average customer satisfaction score is 9.1/10! Once again I would just like to thank Mr Ainsworth for his great comments, and hope that he will continue to renew with us for many years to come. 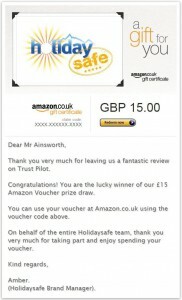 If you’re a Holidaysafe customer who would like to win a £15 amazon voucher, it could only cost 2 minutes of your time. Simply visit our Trust Pilot Evaluation page and leave us an honest review of your experience with us. Your name will then automatically be entered into our monthly prize draw, and we could be contacting you next!